Picked for its bold red color and sparkling silver border and simple but intriguing cover illustration. 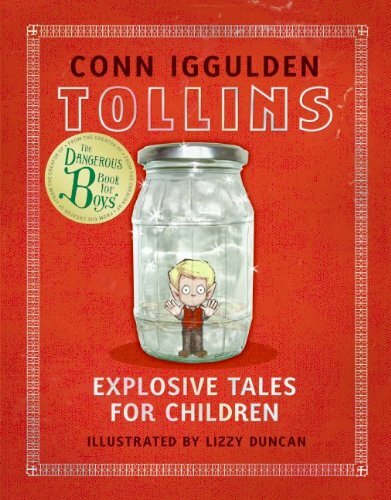 Not to mention the gold sticker reminding us that this book is from the creators of The Dangerous Book for Boys—that’s sure to peak interest even in the most reluctant of readers. Publisher’s synopsis: These are the first three stories of the Tollins. Yes, they do have wings, but no, they aren’t fairies. Tollins are a lot less fragile than fairies. In fact, the word fragile can’t really be used about them at all. They are about as fragile as a house of brick. In “How to Blow Up Tollins” a fireworks factory comes to the village of Chorleywood and the Tollins find themselves being used as industrial supplies. Being blasted into the night sky or spun round on a Catherine wheel is nowhere near a much fun as it sounds. It’s up to one young Tollin to save his people from becoming an ingredient. In “Sparkler and the Purple Death” our hero look execution in the face. Luckily, the executioner’s mask in backwards. Finally, in “Windbags and Dark Tollins” Tollin society faces a threat from the Dorset countryside, which, again, is much more frightening and nail-bitingly dramatic than it actually sounds. You may also enjoy: The Dangerous Book for Boys (this would also look great on the coffee table). What to expect: Weston Woods Studios, Motion picture producers and directors, American children’s literature, History and criticism of animated films. The title is inspiring, but what is fabulous about this nice looking hardcover book is that its cover features some of the most beloved storybook characters. It will be irresistible for many, both old and young. Readers will be inspired to pick up this interesting book and delve into the world of storybook-turn-animated-movie. When the youngest readers see older readers and adults flipping through this book, they will surely be motivated to read the matching books most likely found in their home collection. Publisher’s synopsis: In this lush nonfiction volume–rich with archival photographs, animation cells, historical references, and first-person accounts–readers get a personal, behind-the-scenes look at the man and creative empire who presents the work of leading picture book creators to young people and librarians via the medium of film. Trailblazers in the children’s entertainment industry, Mort Schindel and Weston Woods have, for decades, introduced kids to Maurice Sendak, Rosemary Wells, Mo Willems, and many other notables. Mort Schindel and Weston Woods rival Walt Disney and the Disney studios as forerunners in the creative development and delivery of content for children. Trade has been granted the opportunity to produce this intriguing book to celebrate an important legacy during Mort Schindel’s 90th birthday year. Chicka Chicka Boom Boom: Anniversary Edition by Bill Martin Jr.
Leave us a comment: What books do you have on your coffee table?